A healthy, well-maintained lawn is the best defence against insect invasion. Insect damage is usually less severe on well-watered lawns. Insects that infest home lawns are generally difficult to notice and their presence goes undetected until significant damage has been done. Insect damage can often be mistaken for drought damage. If the lawn remains brown or shows signs of thinning out despite watering, try closer examination for insects. Regular inspection of the lawn including leaves, stems, roots, thatch and soil will help to determine if the problem is insect-related. Did you know that certain varieties of turf grass such as Fiesta III Perennial Ryegrass contain a fungus called an 'endophyte' which gives the plant a natural resistance to sucking insects such as chinch bug? By overseeding this blend of grass seed into your lawn you can effectively eliminate some of the damage that these annoying insects cause. One of the best ways to reduce the effects of chinch bug feeding is proper irrigation and fertility. Over fertilized lawns with quick release nitrogen promote excessive top growth. This attracts chinch bugs, as they love to feed on the fresh green growth. Using a balanced fertility program with slow release fertilizers reduces surge top growth thereby minimizing the attraction. Secondly, lawns that are irrigated properly suffer less damage as the grass is able to recover much faster from chinch bug feeding. 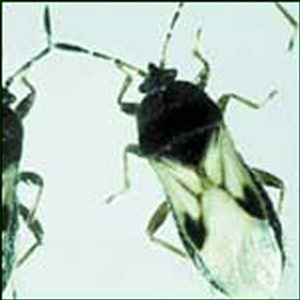 Chinch bug damage is most severe during extended periods of drought. Damage from their feeding is most apparent in July and August. In most cases the damage resembles drought symptoms. Large areas of your lawn may appear wilted with a yellowish brown color, however it will not respond to watering. If your lawn pulls up easily in these areas, this is most likely a sign that insects have been feeding on it. If your lawn also display signs of being torn up, this is usually a grub problem and the result of nocturnal animals such as skunks or raccoons feeding on the grubs. 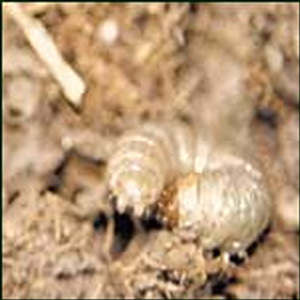 White Grubs are the larvae of 3 different varieties of beetle found in this area. The most common are the European Chafer beetle and the Japanese beetle. Eco-Gro Lawncare is now using GrubGone, a proven eco-friendly bacteria, encased in a granular, which will dissolve into the soil stopping grubs at any stage from causing damage to your lawn. This new product has a wide application window starting in late June, which will allow it to be used curatively and preventively, and will continue to work for up to 90 days, going after and eliminating white grubs at any stage. Lawns that have insect damage characterized by animals digging and turf areas that lift up easily (like carpet) from roots being fed upon. 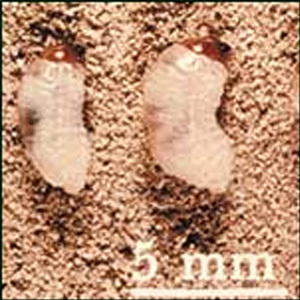 General browning of the lawn or small pockets of dead grass indicates white grub damage. 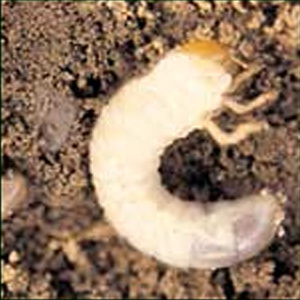 Lawns that have a history of white grubs or other turf damaging larval insect populations. If you think you have grubs or other insect problems contact our office to have your lawn assessed before it is too late.